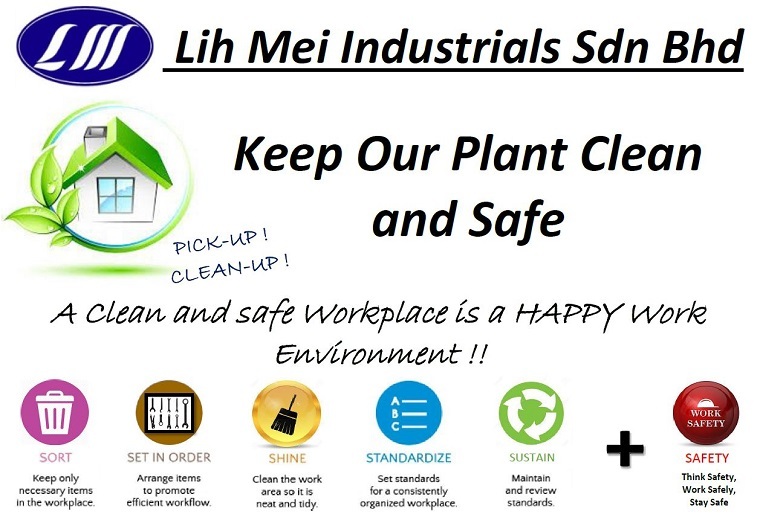 LIH MEI INDUSTRIAL SDN BHD believe that “A clean & safe workplace is a happy work environment”. To create a clean & Safe Workplace, LIH MEI INDUSTRIAL SDN BHD promote the culture of think safely, work safely and stay safe by implement the 5S (Sort, Set in order, Shine, Standardize, Sustain) Policy. To create the concept of “5S is for everyone”. To treat 5S as corporate culture in LIH MEI. To create good corporate image. To improve quality, productivity and work flow. 5S committee has formed to develop and improve the 5S activities continuously. Re-education the employees at all the level to enhance their awareness, understanding and positive attitude to word 5S activities. Lih Mei practices to organize the 5s month every year.